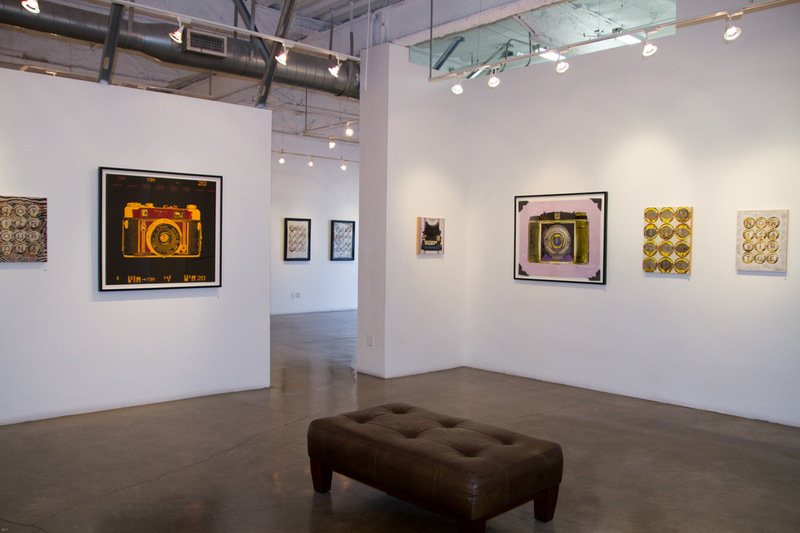 Last year, a Lyft driver told me “Los Angeles will always be an entertainment city first, and an art city second,” describing his experience as a gallery assistant in the City of Angels. Hollywood, television, and the market for entertainment should be taken into consideration for artists based in L.A., especially those who plan to make a living off of their own art. This year, I encountered an artist who does, indeed, make a living via her art by tapping into the veins of Hollywood, pop art, and typewriters. 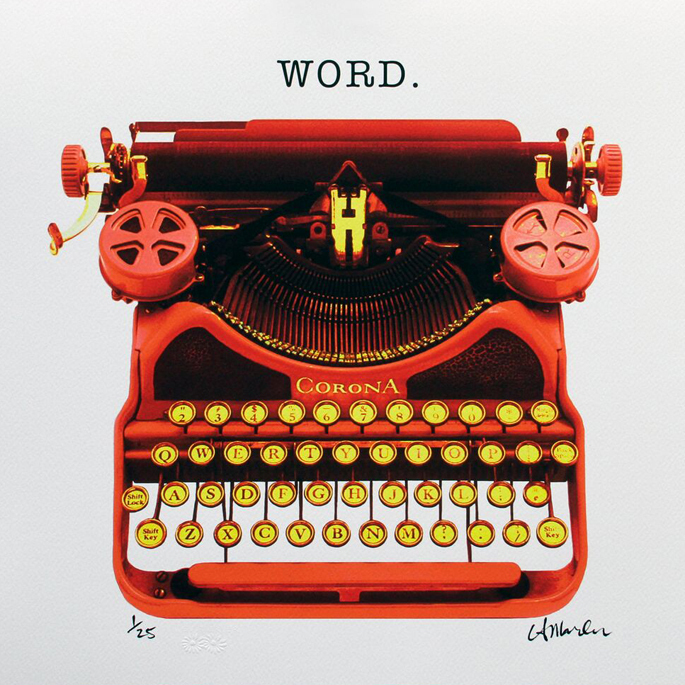 Louise “LA” Marler has made a name for herself as the artist who combines pop art aesthetics with a passion for typewriters. She began as a child working in a small family business of typewriter salesmen, repairmen, and collectors in St. Louis, Missouri. 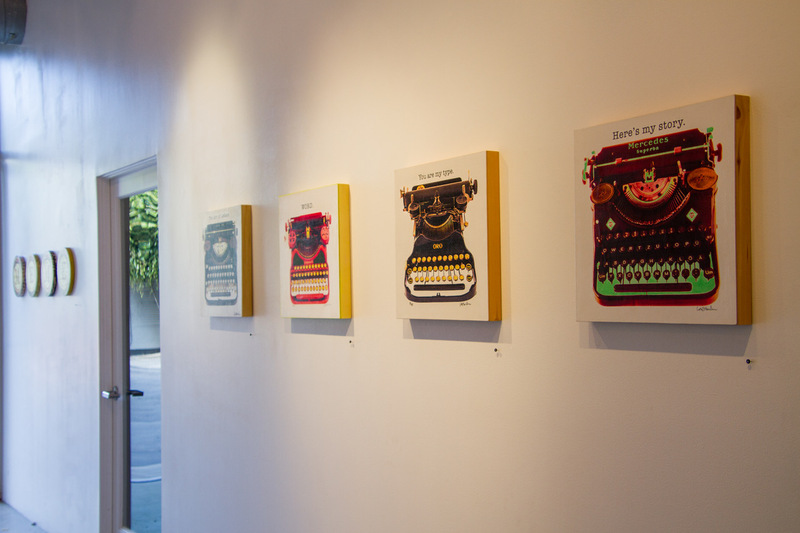 Wanting to realize her full creative potential, she moved to Los Angeles after college, founding her own printing business and later creating her unique brand of typewriter art. “Keywords,” an exhibition at DNJ Gallery, Bergamot Station, Santa Monica, displays giclées, c-prints, light boxes, and wallpaper works by LA Marler, who is a master printer. 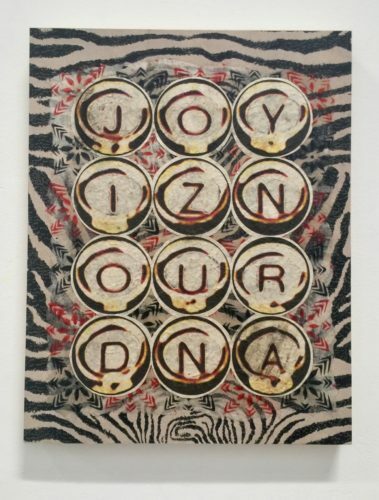 The exhibition focuses on her latest series “Keywords,” and “CamERAS.” “Keywords” are mixed media prints illustrating rows of letters containing positive messages to be deciphered by the viewer. “Our Pure Truth,” and “Meditate On It,” for example, spell out in haiku fashion. 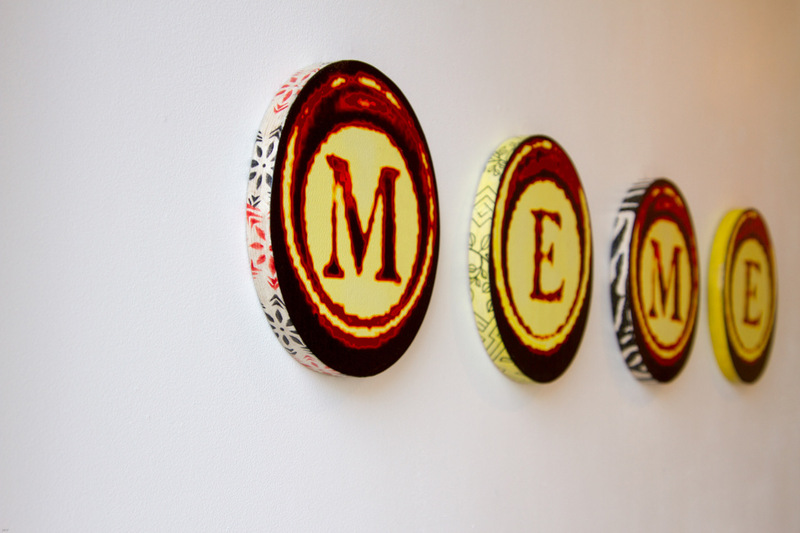 The prints combine digital darkroom and hand painted processes on handmade paper. Iridescent paints contrast with boldly printed typewriter keys. 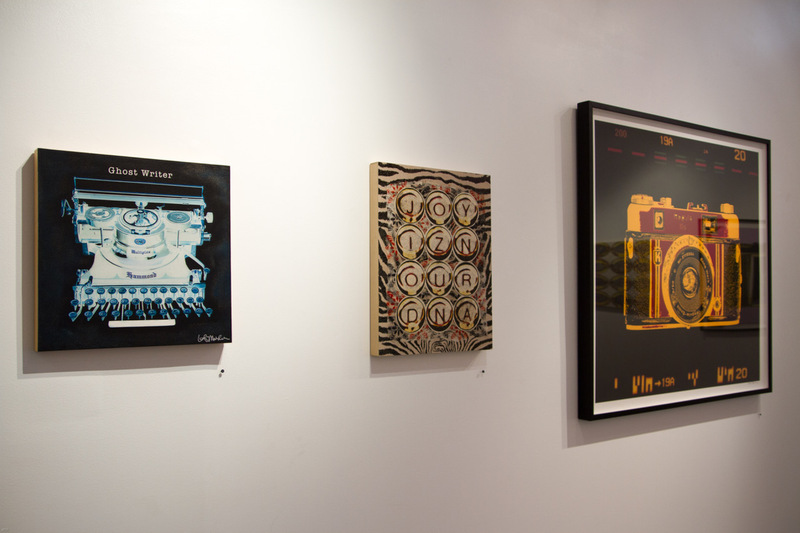 “CamERAS,” a print series using simplistic, monochrome, pop-art printing techniques, illustrates mid-century cameras at poster scale. Think of Warhol’s multi-colored reproductions of Marilyn Monroe—but with a Baldixette. Marler’s pop art imagery could be seen anywhere—in my mom’s kitchen, on the set of a sitcom, or in the poster aisle at Target. What creates the wide appeal for these pop artworks? I started seeing the work through the lens of Marler’s biggest collectors, including celebrity Tom Hanks and sitcom television series such as “Two and A Half Men,” “Curb Your Enthusiasm,” and “Rules of Engagement.” I realized that the artworks blend into the background of everyday life, acting as symbols of art, fitting the description of what people think art is: decorative, invisible, but also historic, nostalgic, a validation of the past. “Keywords” fetishizes typewriters and mid-century cameras, immortalizing their status as icons of creativity and nostalgia. Preserving typewriter history proves necessary, especially for a younger generation whose thought process is heavily influenced by the distraction of hyperlinks. One’s entire experience of writing could be rebooted by such a classic, unforgettable machine. “Keywords” by LA Marler is on view at DNJ Gallery from October 31st through December 9th.